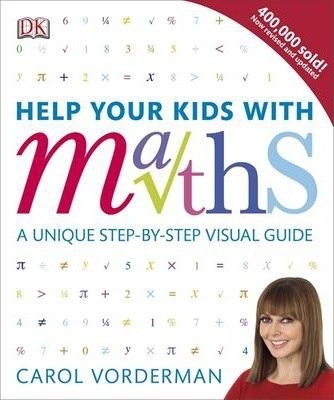 Reduce the stress of studying algebra, geometry, and statistics and help your child with their maths homework, following Carol Vorderman's unique visual maths book. Help Your Kids with Maths shows parents how to work with their kids to solve maths problems step-by-step. Using pictures, diagrams, and easy-to-follow instructions and examples to cover all the important areas - covering everything from basic numeracy to more challenging subjects like statistics, trigonometry, and algebra - you'll learn to approach even the most complex maths problems with confidence. This visual maths guide has been updated and includes the latest changes to the UK National Curriculum and with additional content on roman numerals, time, fractions, and times tables. It also includes a glossary of key maths terms and symbols. Help Your Kids with Maths is the perfect guide for every frustrated parent and desperate child, who wants to understand maths and put it into practise. Carol Vorderman, one of Britain's best known and loved TV personalities, feels passionately about the value of education. Carol joined forces with DK in 1999 to become DK's Education Champion and has helped them to build the bestselling "Made Easy" series, which includes topics in maths, English, and science and technology. She has also encouraged parents and their teenage children to work together in the "Help Your Kids" series, which includes Help Your Kids With Science and Help Your Kids With English. Versatile as ever, Carol has also provided an accessible and fun entry into the world of computer programming with Computer Coding Projects For Kids.